Scouts and Venturers tour the Conservation Trail, which includes exhibits and educational activities presented by the U.S. Forest Service, the National Park Service, and other local, state, and regional environmental organizations. Photo by Daniel M. Reck. 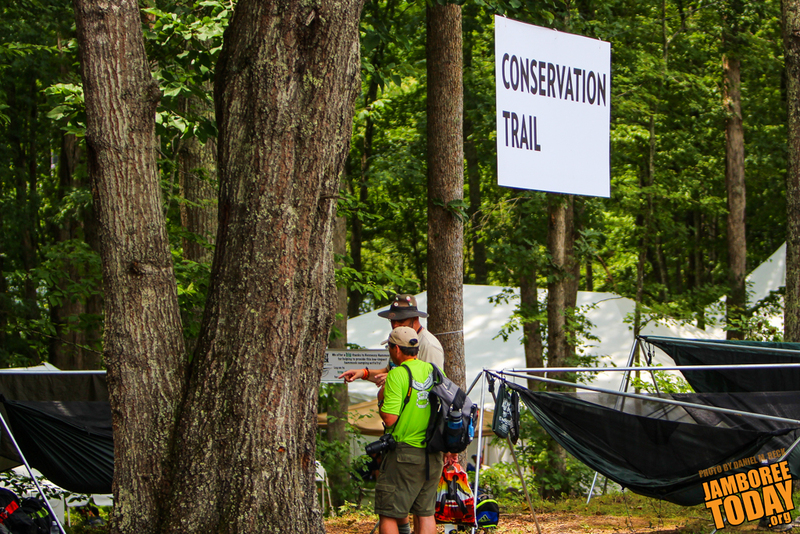 It's one of the shaded, and therefore coolest, places at the 2013 National Scout Jamboree: The Conservation Trail. "We don't have signs to the Conservation Trail yet," says Clark D. Guy, co-chair of nature fishing conservation areas, "but I do hope people will come down and visit. It's well worth the while." Tucked away from the main roads of the Summit Bechtel Reserve, beyond Boulder Cove and to the right of the rock walls, lies a bridge. Past the bridge, down from the road, several white tents become visible, surrounded by shade-giving trees. Soon enough, the beginning of a trail appears, with tents and exhibits at the head. Despite the apparent absence of publicity, that's how Scouts and Venturers find the Conservation Trail at Summit Bechtel Reserve. "I just sort of stumbled across it while looking for a way back to camp," says Eagle Scout Wendell Lorenzen. The Conservation Trail is a product of the efforts of 14 organizations dedicated to conservation and nature, and includes tents, exhibits, and games set up for Scouts and Venturers. 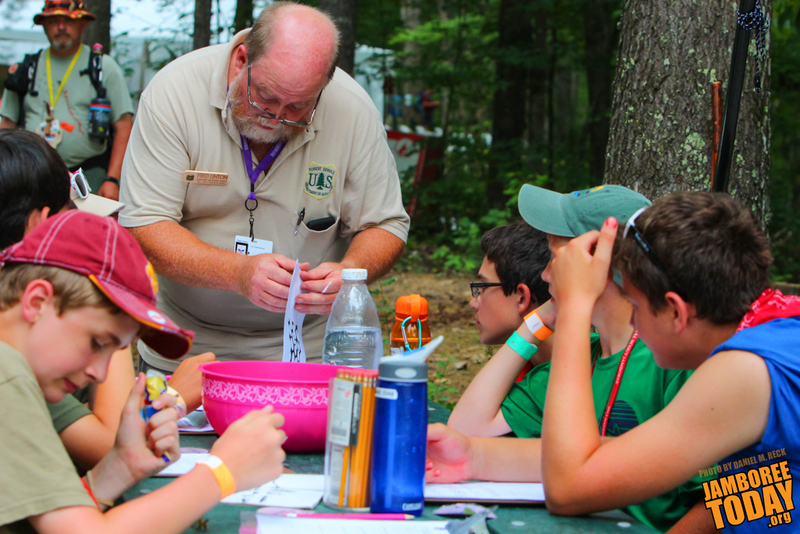 The groups range from the U.S. Forest Service to representatives of the Hornaday Awards, and have such interesting events as a timed puzzle and an interactive role-playing maze. Each organization also offers a commemorative patch or token for completing their activity. Signs pointing to the trail may be sparse, so the trail hasn't been getting the visitors it deserves. "There's stone carving, and you can even get the Pulp and Paper merit badge," says Peyton Haeslip, a Life Scout from Murietta, Calif., and a volunteer with the U.S. Forest Service. "I think it's great to come here and just see all the cool stuff that's happening." The Conservation Trail is open 9 a.m. to 5 p.m. most days of the jamboree. "I wasn't expecting to find anything like this," says Lorenzen. "It's really nice, though." Editor's Note: The photos in this story were updated on July 22, 2013.